The perfect environment to grow your business. New Cambridge House business centre provides high quality accommodation suitable for office and R&D activities. The accommodation is available from two person serviced office suites upwards. Located in Litlington, only 4 miles from Royston and 16 miles from Cambridge, the property offers easy access to the A1(M), M11 and A14. 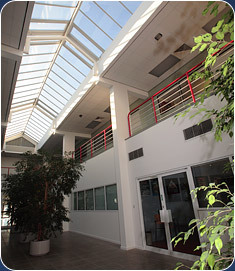 The building sits within attractive landscaped grounds with private in and out access roads and 217 car parking spaces. At the building’s core is an impressive full height glazed atrium.